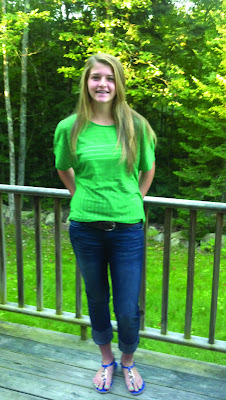 The Windham Eagle Sports: Athlete of the Week "Lyndsey Arsenault"
Athlete of the Week "Lyndsey Arsenault"
Lyndsey Arsenault is The Windham Eagle athlete of the week. The 14-year-old eighth-grader from Windham Middle School is involved in four sports, soccer, basketball, indoor track and outdoor track. Arsenault was nominated by her track coach, Jarrod Fornier, for her commitment and leadership qualities. She is already planning to go to college and play college soccer. When she’s not competing, she likes hanging out with her friends and playing sports. After that’s over she kicks back in her hot tub. Arsenault said she can’t live without food.